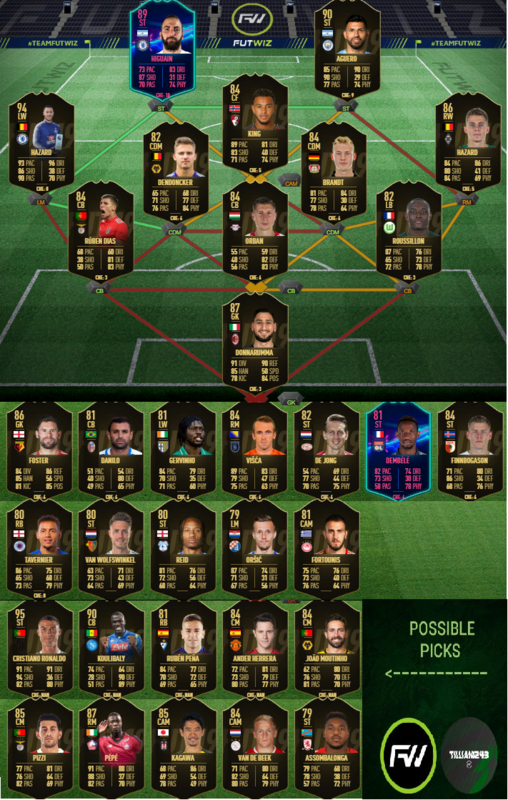 TOTW 21. It looks like much better TOTW than previous one. Cheers, footballers, you did nicely this week. Highlights of this TOTW are: Hazard, another Hazard, Donnarumma again, Agueroooooooo and few more players. There are few OTWs that can be included, like Moussa Dembele who played really well vs PSG or Higuain who scored 2 goals vs Huddersfield, but if they miss out – don’t blame me. Ben Foster still waiting for dynamic image. He played greatly again. Josh King included for a mid-week game vs Chelsea. So, overall, this TOTW looking nicely for red player picks.